I'm a freelance writer in Brisbane who is passionate about the food and wine scene in the Granite Belt, Queensland. I am writing a book of the people and food of Stanthorpe and plan to launch the publication in 2014. Touring in an old school, vintage car-for-hire is nothing new. But have you had a personalised tour of Brisbane in a time machine? Go back, back to the future, where the year is 1985, and Michael J. Fox starred as a bright-eyed, fresh-faced teenager, Marty McFly, and Huey Lewis and the News taught us about 'the power of love'. 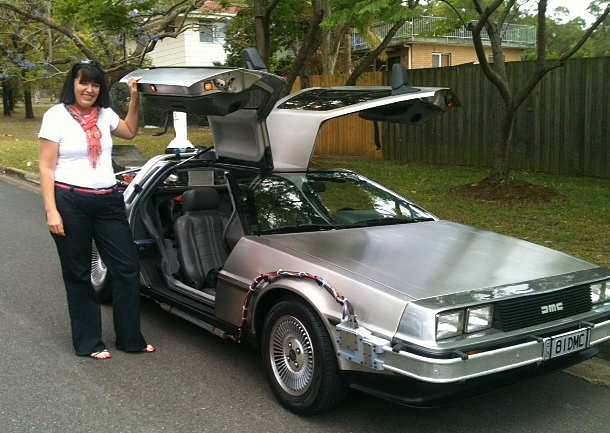 In Brisbane, you can get old school, ala 1985 style: you can hire a converted DeLorean-come-time machine in the style of the movie, Back to the Future. Brad Gaffy is a self-confessed geek, and owner of the time machine. He hires the DeLorean for events (the latest being the 1st anniversary for Movie Empire at Morningside) as well as weddings and formals for guests to be photographed in the iconic car. And you can hire the DeLorean to be driven around town, picked up from the airport, anywhere you need to go. Yours truly with the DeLorean about to go back in time. Eighties styling (love the gull wing doors) meets mod cons: Brad has fitted a CD player with stereo speakers, rather than keep the original tape deck. He sources parts to convert the 1981 DeLorean to the movie specifications for Doc's time machine, complete with Mr Fusion, and soon-to-be-fitted, flux capacitor. The engine roars. To talk to Brad, we have to yell at each other over the engine noise. And I didn't care in the slightest: the roar of the engine is part of the charm of this 80s motoring icon. It was wonderful to sit back in the leather-covered, sports seat and let Brad do the driving, while the Back to the Future soundtrack boomed from the speakers. My hour with Brad started in western suburbs, along the riverside expressway, through the CBD to Paddington, with a brief stop at Suncorp Station to show the car to a school group we had spotted. If only I could for real. How cool. They must be uber fans to put all that hard work into converting the car. Brad is indeed a hard-core fan and uses only parts that meet the original movie specifications. His passion and knowledge was impressive! Thanks For the great story Lou! It was a pleasure meeting you and driving around Brisbane. I know you are Matthew Reilly's no.1 fan! :) cheers, Brad.